Nuclear power contributes only a small share to global energy production. According to World Energy Statistics 2015 published by the International Energy Agency, nuclear power accounts for 4.8 per cent of the total primary energy supply worldwide, far behind oil (31.1 per cent), coal (28.9 per cent), natural gas (21.4 per cent) and even behind biofuels and waste (10.2 per cent). Of the producers of nuclear power, the United States is by far the largest with 33.2 per cent of the world’s total, followed by France (17.1 per cent) and Russia (seven per cent). The UK’s production accounts for just 2.9 per cent. In contrast, France generates the largest share of its domestic electricity generation from nuclear power (74.4 per cent). It is followed by Sweden (43.4 per cent), Ukraine (43.0 per cent) and South Korea (25.8 per cent), while the UK comes fifth with 19.2 per cent. According to a 2014 OECD study, the largest currently known recoverable resources exist in Australia (approximately 29 per cent of the world), Kazakhstan (12 per cent) and Russia (nine per cent). When looking at the actual production, more than half the world’s extraction takes place in Canada (28 per cent) and Australia (23 per cent). A 2010 study concluded that there have been at least 99 recorded nuclear power plant accidents between 1952 and 2009. 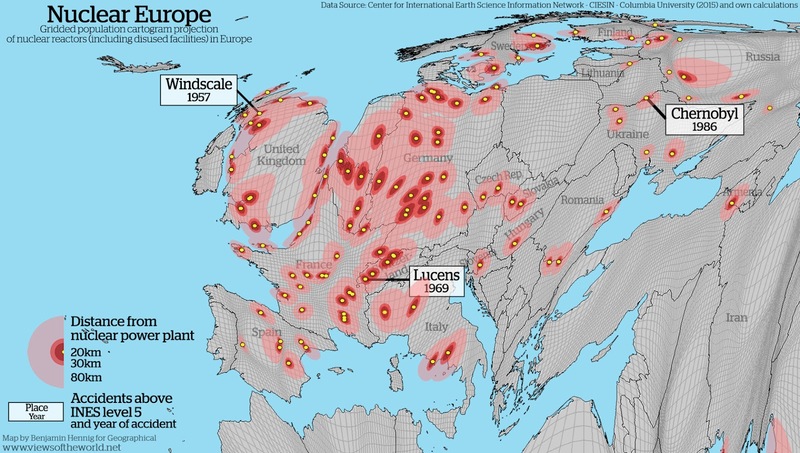 Chernobyl (1986) and Fukushima (2011) have been the most severe and were classified as level 7 (‘major accidents’). The worst event in the UK was the 1957 Windscale fire at the Sellafield site which was classified as a level 5 ‘accident with wider consequences’. The cartogram below displays locations of nuclear power plants from an IAEA database of nuclear reactors published by the Center for International Earth Science Information Network (CIESIN) at Columbia University. This includes facilities which are at varying stages of decommissioning – a time-intensive and expensive process due to its continuing hazards. In addition to the locations of the nuclear plants, circles of 20, 30 and 80km distances are drawn as the immediate risk zones. 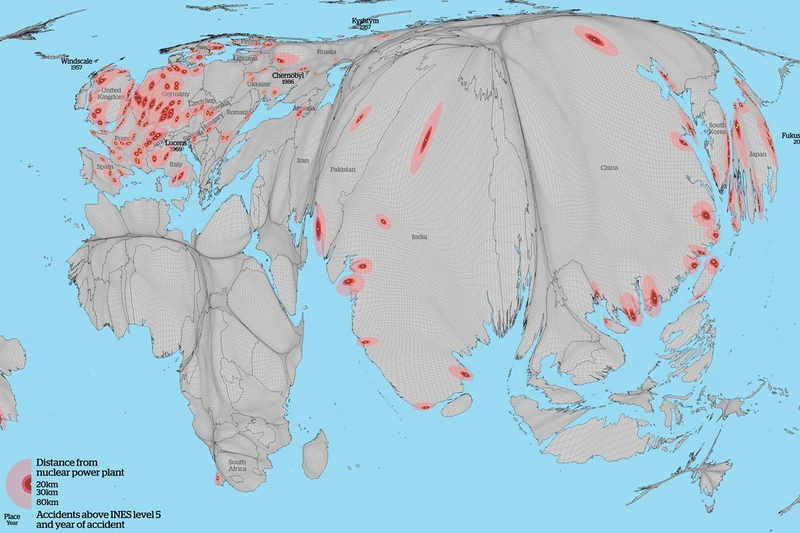 The underlying basemap uses a gridded cartogram based on equal population projection to put the differing exposures of populations into perspective. Each circle of equal distance is resized relative to the number of people living in the vicinity of each nuclear power plant. The locations of the most severe incidents above INES level 5 are highlighted.